Yesterday was a day of many firsts. 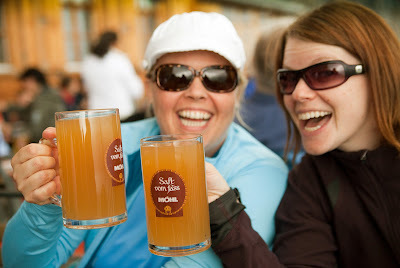 We joined a couple friends out in the east side of Switzerland to witness the yearly celebration of the Alpabfahrt. This is the time of year with the herders bring in their cows from the upper mountains. You would just be driving along and all of sudden there were be men dressed up in traditional Swiss gear and a pack of cows strolling down the street. So very Swiss. I would say it was worth getting up at 6:30am on a Saturday to see. 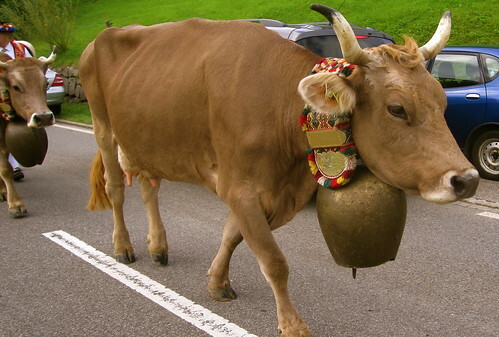 Cows with massive bells attached to their necks. 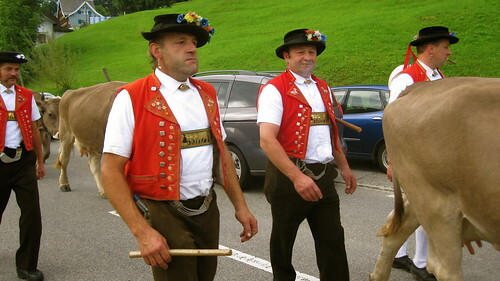 Swiss men wearing funny hats and smoking cigars. You don't get to see this every day. When most people think of Switzerland, this is probably what they picture. Along with seeing the Alpabfahrt, we had been invited to experience some real Swiss hiking. We were being taken up to Wasserauen in the Alpstein (foothills of the Alps), being told that this was an easy hike. 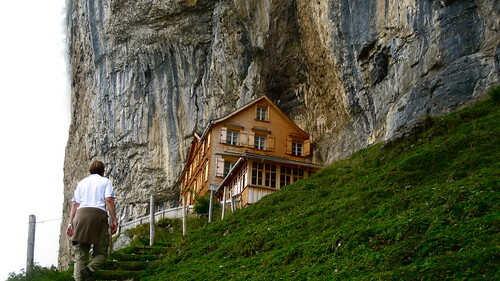 I think they even said, "Oh, this is one of the easiest hikes in all of Switzerland. It will be a piece of cake". You should be aware that when a Swiss person says something is easy, it will be a challenge. I went in with the assumption I would be gasping for air the entire way up and our Swiss friend would end up carrying me a third of the way to the top. Somehow we made it one piece, but I wouldn't say it was easy. Notice how our friend isn't even sweating. This is after an hour and a half uphill to Äscher. Just a Saturday stroll for HansPeter. My motivation came from knowing there would be Rösti and beer at the top of this mountain. Rösti goodness with some Käse und zwei Eier. Good to the last bite. If the day couldn't get any more Swiss, these ladies busted out some true yodeling while we ate overlooking the Alpstein. Such a beautiful area in Switzerland. So much to see and nothing like we had experienced before. Next trip maybe we check out the Seeaplsee or even get crazy and do a multi-day hike up to the peak, Säntis. 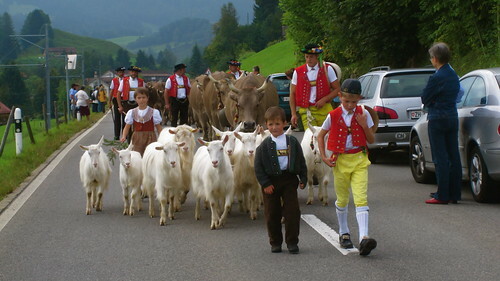 So basically alpabfahrt is the swiss version of the 'Running of the bulls'! Glad that no one was injured!! This is hilarious. The beers always look big- don't think I will be able to hang on those! What is rosti? Looks dee-lish! Hope you are doing well and December can't come fast enough!! That beer was awesome. It was Apfelsaft mit Alkohol. I would do the hike again knowing that beer would be there waiting for me at the top. Can you guys get her already? Looks like you've been eating like I've been eating! I did run 2 miles and then went to spin class yesterday. Was feeling a bit guilty. I miss yoga with you! Not the same here for sure.